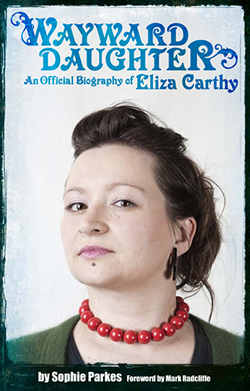 Wayward Daughter: An official biography of Eliza Carthy: Wayward Daughter is one year old today! Wayward Daughter is one year old today! Yes, it's been a year since the wonderful, the amazing Phil and Sue from Soundcheck Books published Wayward Daughter: The official biography of Eliza Carthy - and what a year it has been! There was the launch with Eliza herself at The Greystones in Sheffield, then there's been countless excellent reviews (you can read some of them here)... and now we're just putting the finishing touches to the e-book, and you'll be able to purchase that, too, alongside Eliza's retrospective CD, also called Wayward Daughter (which is out on June 3rd). And if that's not enough, then get yourself along to a gig on the Wayward Tour: an all-star cast is supporting Eliza in celebrating 21 years on the road and Jim Moray 10 years. I'll be heading to the Buxton Opera House gig on Monday 27 May, so if you see me, do say hello! Thanks for buying the book and supporting us. It's been a fantastic year.